Food dehydrators are used to remove water content from foods in order to eliminate the humid environment required by bacteria to develop. This makes it possible keeping the dried foods for extended periods. Most Electric food dehydrators make use of heating elements, fans and air vents to generate the hot air flow required for the dehydration. The foods to be dehydrated are placed on stacked food trays. When buying a dehydrator, it is better to get one with the fan and the heating elements at the top or on the side of the unit, rather than at the bottom. This is because, when they are at the bottom, they tend to get soiled by liquids dripping from the foods contained in the trays. This makes the unit hard to clean and decreases its durability. Also, if you cannot wait around for the drying process to complete, you should consider getting a unit with a timer and automatic shut-off feature. It is definitely worth paying the extra few dollars to obtain a dehydrator that will allow you to set and forget! When you compare food dehydrators in the Amazon Best Seller List, at the time this review was written, out of the first 50 best selling dehydrators, 11 belonged to Nesco and 13 belonged to Excalibur! No other brand comes even close to this sort of popularity. Nesco and Excalibur must be doing something right! But which will respond better to your needs: Nesco or Excalibur? Nesco makes round and expandable dehydrators, while Excalibur focuses on rectangular and fixed size units. Round dehydrators usually have top or bottom mounted heaters and fans, while rectangular units usually have side mounted heaters and fans (on the back of the unit). So, with round units, when the heater is at the top, you have top-to-bottom air flow, and the bottom trays may not dry at the same rate as the top ones, and if the heater is at the bottom, you have bottom-to-top air flow, and the top trays may not dry at the same rate as the bottom ones. To get all trays dry at the same rate, rotation of tray positions may be required. This is not required with rectangular dehydrators since the heated air flow emanates from the backside of the unit and applied horizontally and uniformly to all the stacked trays. The two electric food dehydrators carefully chosen here for review are the Nesco FD-1040 & FD-61 and the Excalibur 3926TB & 3900B. These products are some of the best you can buy nowadays in their product category, and have enjoyed great reviews from both Amazon customers and many respected reviewers. Detailed descriptions of these products and recommendations follow. The Nesco FD-1040, shown in the picture on the right, is the Top of the Line Nesco dehydrator. The 1000 watt digitally controlled unit is very powerful and can dry more foods faster. It comes with 4 trays, but can be expanded to 20 trays allowing to dry very large quantities of foods. Tray size is 15.5-inch diameter (1 sq-foot per tray). It has a top mounted fan that eliminates liquids dripping into the heater chamber, and the patented Converge-Flow system forces heated air down the exterior pressurized chamber, then horizontally across each individual tray, converging in the center, for fast, even and nutritious drying. Flavors don't mix, and there's no need to rotate the trays. Note that drying pressure adjusts automatically to the number of trays. The 2,400-RPM motor and the specially designed 4-1/2 inch top mounted fan mean faster and more nutritious drying. This unit dries foods four times faster than dryers which have no fan or motor: it dries in hours, not days. For example, fruit rolls dry in 3-6 hours, beef jerky in 4 hours, apples in 4-6 hours, nananas in 5-8 hours and pineapples in 4-6 hours. For a 2400 RPM motor this dehydrator is surprisingly quiet. Because different foods require different drying temperatures, it is equipped with a digitally adjustable thermostat that can be set from 90°F to 160°F and that gives you the flexibility to get the best results. The unit is also equipped with a digital timer that is programmable for up to 48 hours of drying time. The opaque Vita-Safe exterior blocks light to retain more of the food's nutrients and vitamins during the drying process. ​It comes with a 52-page recipe and instruction book, 4 drying trays, 1 solid sheet, 1 mesh sheet, and 1 packet jerky spice to make great tasting beef jerky or venison jerky. Another Nesco dehydrator with a top-mounted fan system that prevents any possibility of liquids dripping into the heating chamber and fan, is the very popular Nesco FD-61, shown in the picture on the right. This is a 500 watt unit that comes with 4 trays, 1 sq-foot each, expandable to 12 trays. It has a top-mounted 2100RPM fan system, and it is equipped with an adjustable thermostat that can be set from 95°F to 155°F. It uses the same patented special air flow technology as the Fd-1010 and therefore, according to product specifications, there is no need to rotate trays. Note that, if you need to dry large quantities of foods, the FD-1010, which can expand up to 30 trays, is a better choice than the FD-61. If you do get the FD-1010, one easy way to avoid any drips into the bottom mounted fan system is placing a solid tray at the very bottom of the tray rack. Any drips will then be collected by the bottom tray. The Excalibur 3926TB, shown in the picture on the right, is a rectangular 600 watt unit, measuring 12.5" by 17" by 19". It comes with 9 trays, each measuring 15" by 15". The unit is not expandable. Like most rectangular dehydrators, it has a back mounted fan and heater system which enables even air flow through all nine trays, and no tray rotation is needed. It is equipped with an adjustable thermostat which allows to set temperatures from a low 95F to a high 155F. The provided temperature range is low enough to preserve health-wise beneficial active enzymes in veggies and fruits, but also high enough to meet safety requirements for drying meat for jerky. But the best part of this unit is its timer that can be set up to 26 hours. This is a true set-and-forget type unit. It automatically turns off when the set time is complete. A Guide to Dehydration booklet is included. It comes both in black and in white, and a limited 10-year warranty. The Excalibur product line also offers the Excalibur 3900B 9-tray model which is identical to the Excalibur 3926TB, minus the timer. So, if you think that you don't need a timer, you could buy the 3900B model and save about $50. 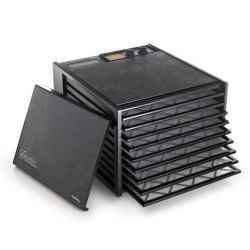 So which Food Dehydrator to buy? 1If you need to dry very large quantities of foods get the Nesco FD-1040 which can expand up to 20 trays. 2If you want a unit with a back (or side) mounted fan system, then get an Excalibur. Even though the patented special air flow design of the Nesco units are supposed to avoid tray rotation, some Amazon Nesco customers have noted that they did have to resort to rotation to achieve better results. 3If you don't want a unit with a bottom mounted fan system to prevent any possibility of liquids dripping into the heating chamber and fan, then you may consider any of the four dehydrators described here. 4Finally, if you want a unit with a programmable timer, then you should get either the Nesco FD-1040 or the Excalibur 3926TB. 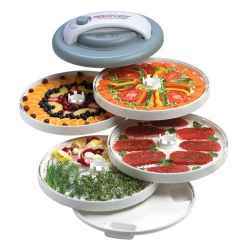 Note that there are dozens of food dehydrators out there that you can get for a lot less than those reviewed here. But by saving a few dollars you will lose a lot in quality, features, durability, and in the results you will obtain. The Nesco and Excalibur units reviewed may cost a bit more, but should normally provide you with total satisfaction. Please click your selection below for price information or to purchase. Note that if some prices are not shown on the Amazon link images below, they will be provided once you click the images.